One of the most memorable coffee experiences I’ve had was going out to visit the Greenwell Plantation on the big island of Hawaii. Not only did I get to taste coffee cherries right off the tree, but I got to taste some of my favorite Kona coffee in one of the freshest batches you can get. 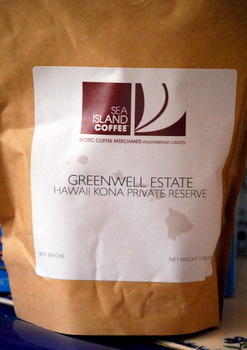 I got this batch of Greenwell Estate Private Reserve Kona Coffee from Sea Island and I have to say that they make very quick work of the shipping and – aside from the lovely Hawaiian weather – you’re not missing anything by making the coffee at home and not traveling out to the plantation. The Greenwell Estate coffee is earthy, sweet and tangy. It is really rich tasting and full bodied, and actually reminds me a lot of red wine, although probably better. I’d make this a daily brew if only I could pick it up at my local store, instead of having to have it shipped! For other fans of Kona coffee, I previously bought green beans from Greenwell Estate and roasted them at home with good results. A fun project if you have the time and outdoor space!